After many people in the Puget Sound region had dismissed any chance of snowfall in the lowlands this season, the region is now on track for not one, but two, and possibly even more snowstorms this winter. Nick Bond, a University of Washington associate professor of atmospheric sciences who serves as Washington’s official state climatologist, commented Thursday on the upcoming snowstorm – the second to hit the Puget Sound region this week. 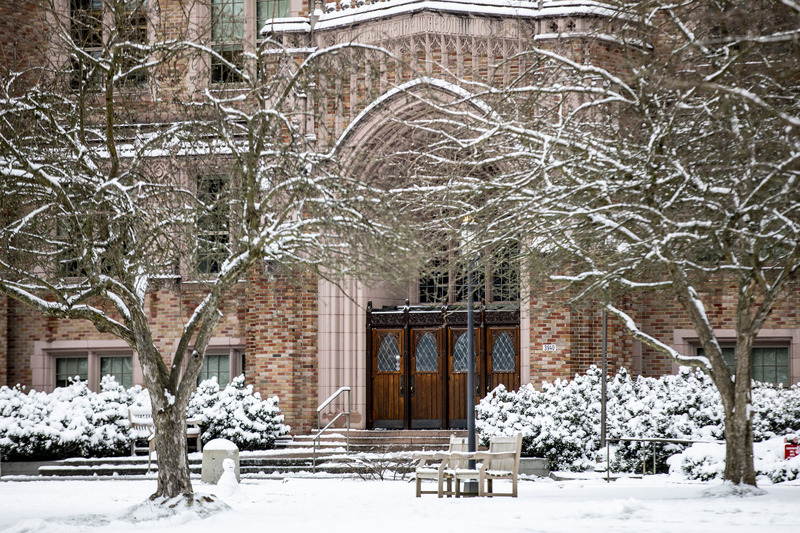 The UW campus will suspend operations, including canceling classes, starting Friday midday, and updates are posted to the UW homepage and to the UW Alert blog. Sign up for email and text alerts here. It’s not a coincidence that we’re getting even more snow – the situation on the ground matters for the coming snowstorm, Bond said. Because the ground is already cold, that will chill the air enough that this storm will likely bring snow from the start, instead of rain followed by snow. Also, this cold spell means that snow will likely last on the ground longer. “It is a very unusual situation we’re in, which is sustained cold weather,” Bond said. “Oftentimes, the atmospheric circulation patterns get into a state that’s favorable for snow, but because it’s a rare event, it just doesn’t hang around that long. Then we get back to more air coming off the Pacific Ocean that’s relatively mild, and a return to more normal temperatures. Bond defers to the National Weather Service for exact predictions, and notes that the exact timing and location of the heaviest snowfall is hard to predict. But he expects it to be a more unusual event in the lowlands than at higher elevations. Bond is a member of the Joint Institute for the Study of the Atmosphere and Ocean, a collaborative research center between the UW and the National Oceanic and Atmospheric Administration. The air that is hitting us is not the same mass of cold air that hit the Midwest a few weeks ago, but the two events are somewhat related, Bond said. One common question in the media is whether the “polar vortex” might be destabilized, sending more Arctic air into the mid-latitudes under global warming. Bond said that with a short record and evidence on both sides, the jury “hasn’t even been called yet” to establish if that connection exists. As for whether this cold snap disproves global warming, Bond said the answer is clearly no. And the cold seems likely to stick around.